Untruth was not acceptable to Rama specially in a hermitage that too in the presence of women. This is the end of the Seventeenth chapter Of the book of Aranya (Forest) of the holy Ramayana composed by Valmiki as the first epic. This is the end of the eighteenth chapter Of the book of Aranya (Forest) of the holy Ramayana composed by Valmiki as the first epic. But then those nocturnal Rakshasas with sharp arrows were not able to face the lustrous Rama , like a wild elephant is not able to face the forest fire. This is the end of the nineteenth chapter Of the book of Aranya (Forest) of the holy Ramayana composed by Valmiki as the first epic. This is the end of the twentieth chapter Of the book of Aranya (Forest) of the holy Ramayana composed by Valmiki as the first epic. When that invincible lady was addressed like this by Khara , wiping out her tearful eyes , she told Khara. This is the end of the twenty first chapter Of the book of Aranya (Forest) of the holy Ramayana composed by Valmiki as the first epic. ( After getting angry at Soorpanakha and promising that he will kill Rama , Khara marches along With Dhooshana , his commander and other fourteen thousand Rakshasas to kill Rama). 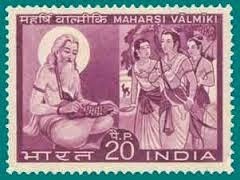 This is the end of the twenty second chapter Of the book of Aranya (Forest) of the holy Ramayana composed by Valmiki as the first epic. On the flag flying on the golden staff , a very frightening vulture with a huge body settled down. Jackals which appeared scared ran towards Khara screeching as if fire was produced from their mouth. These ill omens indicate inauspiciousness and provided dreadful evidence of what is likely to happen. This is the end of the twenty third chapter Of the book of Aranya (Forest) of the holy Ramayana composed by Valmiki as the first epic. Then Seeing Rama with great luster waiting to fight the war , all beings were alarmed with great fear. This is the end of the twenty fourth chapter Of the book of Aranya (Forest) of the holy Ramayana composed by Valmiki as the first epic. This is the end of the twenty fifth chapter Of the book of Aranya (Forest) of the holy Ramayana composed by Valmiki as the first epic. When this was happening , three very angry chiefs of the army called Mahakapala, Sthoolaksha and the very strong Pramadhi ran towards Rama not understanding that they are running towards death. After angry Khara spoke like this his twelve army chiefs , Syenagami, Pruthugriva, Yajna satru, Vihanga, Durjaya, Karaveeraksha, Parusha, Kalakarmuka, Meghamali, Mahamali, Sarpasya, Rudhirasana who were very valorous along with their army men advanced towards Rama releasing excellent arrows at him. This is the end of the twenty sixth chapter Of the book of Aranya (Forest) of the holy Ramayana composed by Valmiki as the first epic. This is the end of the twenty seventh chapter Of the book of Aranya (Forest) of the holy Ramayana composed by Valmiki as the first epic. This is the end of the twenty eighth chapter Of the book of Aranya (Forest) of the holy Ramayana composed by Valmiki as the first epic. This is the end of the twenty ninth chapter Of the book of Aranya (Forest) of the holy Ramayana composed by Valmiki as the first epic. After telling like this to Rama, with raised eye brows due to great rage was searching all over for something to be used as weapon and that Rakshasa not far from there saw a very huge Sala tree . This is the end of the thirtieth chapter Of the book of Aranya (Forest) of the holy Ramayana composed by Valmiki as the first epic. This is the end of the thirty first chapter Of the book of Aranya (Forest) of the holy Ramayana composed by Valmiki as the first epic. He was attired greatly wearing divine cloths and ornaments , was shining wearing divine garlands , was sitting on his seat like Sun and was sitting on a raised throne like the God of death of God of death. This is the end of the thirty second chapter Of the book of Aranya (Forest) of the holy Ramayana composed by Valmiki as the first epic. This is the end of the thirty third chapter Of the book of Aranya (Forest) of the holy Ramayana composed by Valmiki as the first epic. “ Rama gave protection to the sages and made Dandaka a safe place for them and that great one left me only alive but after insulting me because he was not inclined to kill women as he followed laws. This is the end of the thirty fourth chapter Of the book of Aranya (Forest) of the holy Ramayana composed by Valmiki as the first epic. After thinking about pros and cons of the actions to be undertaken, , after considering the good and bad as well as strength and weakness of that matter , deciding on the course to be followed that one who acts according to his own decision made by a firm mind, Ravana went to the place of his vehicles. He continued seeing waterfalls that delighted the mind , ponds with pleasant water , cities filled with wealth and grains , and gem like women shining and cities with elephants, horses and chariots. This is the end of the thirty fifth chapter Of the book of Aranya (Forest) of the holy Ramayana composed by Valmiki as the first epic.